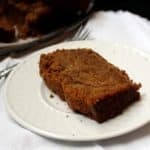 This vegan Brown Sugar Pound Cake melts in your mouth and has the most delicious, buttery flavor infused with vanilla and amaretto. Aquafaba gives the perfect texture. Mix the flour, cornstarch and baking soda in a bowl and set aside. Place the aquafaba in a bowl and beat with an electric mixer until soft peaks form, about five minutes. In a large bowl or in a stand mixer with the paddle whisk attached, beat the sugar and butter until fluffy. Add the applesauce, vanilla and amaretto and continue to mix until incorporated for another minute. Scrape down the sides and bottom of the bowl several times with a spatula through this process to make sure everything comes together evenly. Add the flour in two installments, beating the flour into the butter mixture after each addition. Scrape down the sides and bottom of the bowl to ensure everything is well mixed. Remove the bowl from the stand mixer and using a spatula, fold in the whipped aquafaba until incorporated. Prepare a 9-inch loaf pan by buttering and flouring it. Scrape the batter into the loaf pan and smooth the top with the spatula. Bake 1 hour and 20 minutes or until a toothpick inserted in the center comes out clean. Cool thoroughly on a rack before running a knife along the sides and unmolding.